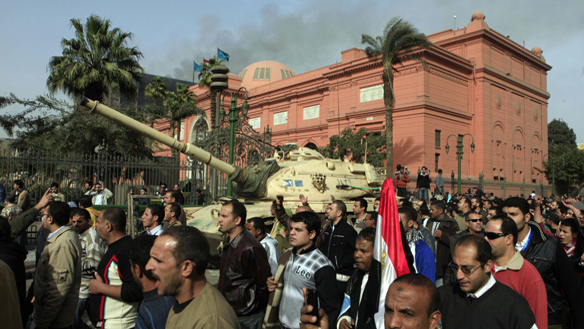 As anti-government protests escalate in Egypt, the art world monitors the situation with deep concern. According to news reports, on January 28th a thousand people jumped over a wall into the compound of the Egyptian Museum. The museum houses the world’s most important collection of Egyptian antiquities, with over 100,000 objects on display. Most of the looters only went as far as the gift shop, which luckily did not give direct access to the galleries. However, ten people did manage to enter the main building. Apparently looking for gold, the looters destroyed 13 vitrines and tore the heads off two 2,000-year-old mummies. A brigade of ordinary citizens formed a human chain outside the museum to prevent the looters from getting away and to keep others from entering the museum. 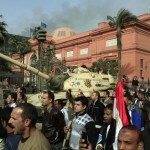 According to artinfo.com, many Egyptian artists are at the forefront of the protests. Cairo-based artists Amel Kenawy and Lara Baladi, both of whom are well known in Dubai for exhibitions at local galleries, art fairs and the Sharjah Biennale, have publicly voiced their support of the uprising. Sossy Dikijian of Artspace Gallery in Dubai says they have heard from two of the gallery’s Egyptian artists who are reportedly safe and sound, and active in the protests as well.